Gather with other women guitar enthusiasts for learning and revelry in a supportive, beautiful environment! Twice a year, we gather at our Mendocino retreat center for a long weekend of guitar study, song circles, performance opportunities, jamming, and wholesome, delicious, catered food. Using songs from Folk, Blues, Celtic, Pop, Swing/Jazz, and Bossa Nova traditions, our caring, expert teachers create a curriculum responsive to the interests and experience level of our campers. Beginners, Intermediate, and Advanced Players welcome! Join our Twelve-Fret Support Group for women who love guitar too much! “The collective and supportive atmosphere allowed my relationship to the guitar to flourish! Thank you, thank you, thank you!” D.C.
Women's Hearts and Hands Guitar Camp was established in 2001. To see our Photo Albums, click 'Photos' beneath our banner! Come to the August 3 - 6, 2018 Session of Women's Hearts & Hands Guitar Camp! Come to the Jan. 12 - 15, 2018 Session of Women's Hearts & Hands Guitar Camp! Come to the Jan. 13 - 16, 2017 Session of Women's Hearts & Hands Guitar Camp! 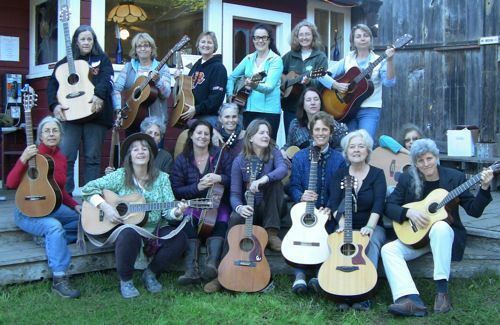 Register for the August 2016 session of Women's Hearts and Hands Guitar Camp!